Welcome to the area of our web site where we will give you a brief history of the United States flag, as well as many other flags used throughout the history of this great country. The current official U.S. flag is a 50 star flag, born of the need for a more practical design to accommodate new states entering the union. On April 4, 1818, Congress established the number of stripes at seven red and six white, and provided the addition of one star for each new state. The thirteen stripes represent the original 13 colonies. The 50 star flag has been in use since July 4, 1960 when Hawaii officially joined the union. In the first years of the Revolutionary War, America fought under many flags. One of these flags, called the Grand Union, flew over George Washington's headquarters near Boston. It was the first American flag to be officially recognized by another country. On November 16, 1776, the American warship, Andrew Doria, saluted a Dutch fort in the West Indies and was saluted in return. This brought a measure of international recognition to the United Colonies. A flag with thirteen stars and thirteen stripes received its first salute from another country on February 14, 1778, when French vessels in Quiberon Bay, France, saluted John Paul Jones and his ship, "The Ranger." No one positively knows who designed the first Stars and Stripes, or who made the first flag. Soon after the flag was adopted by our new government, Congressman Francis Hopkinson claimed that he had designed it. Some historians believe that Betsy Ross, a Philadelphia seamstress, made the first U.S. flag. On June 14, 1777, in order to establish an official flag of the new nation, the Continental Congress passed the first Flag Act: "Resolved, that the flag of the thirteen United States be thirteen stripes alternate red and white; that the union be thirteen stars, white in a blue field, representing a new constellation." Click on any the flags to go to our shopping area to see the available sizes, prices, and materials in which we offer these historical flags. This flag was carried to the New World by most of the early English explorers. Its use can be traced back to 1277 in Britain. One of the military colors used by British colonial troops after 1743. As the British Union Flag it was the standard raised by the Jamestown settlers in 1607. 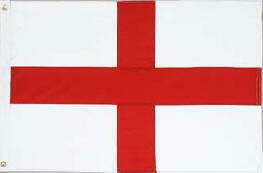 The design originated when King James I of England combined the St. Georges Cross with the Scottish Cross of St. Andrew. In 1707 Queen Anne adopted a new flag for the United Kingdom - The Union Jack on a field of red. Called the British Red Ensign, Corwallis surrendered under this flag at Yorktown in 1781. Colonel John Trumbull's painting, "The Death of Warren," now at the Yale University Art Gallery, shows the red Continental Flag to be the one used by American forces at the Battle of Bunker Hill, June 17, 1775. The first (unofficial) national flag of the United States. It was raised in 1776 to celebrate the official status of the newly formed Continental Army by General George Washington, whose camp was then in Cambridge. Also known as the Cambridge Flag or Continental Colors. This flag combined the British Union Jack and the thirteen stripes signifying Colonial unity. The first official United States flag, adopted by an Act of Congress on June 14, 1777. According to legend, a group headed by George Washington commissioned Philadelphia seamstress Betsy Ross to execute their design for presentation to Congress. Believed by many authorities to be the first Stars and Stripes used by American land troops. Flown over the military stores at Bennington on August 16, 1777 when General John Stark's militia led Americans to victory over British raiding force. The original flag is preserved in the Bennington, Vermont Museum. This unusual flag was made with thirteen 8-point stars in a wide field. Historical records report this flag carried by North Carolina militiamen at the Battle of Guilford Courthouse on March 17, 1781. Shortly before the War of 1812, two new states were added to the Union and a flag consisting of 15 stars and 15 stripes was created. The Star Spangled Banner, flying over Fort McHenry during a British naval bombardment, inspired Francis Scott Key to compose what later becomes our National Anthem. This design, born with the Second Flag Act on January 13,1794, is our only official flag ever to have more than thirteen stripes. The restored flag now hangs in the Smithsonian. The "Jack" was the flag of the Confederate Navy. It is a rectangular rather than square flag and omits the thin white border around the outside. 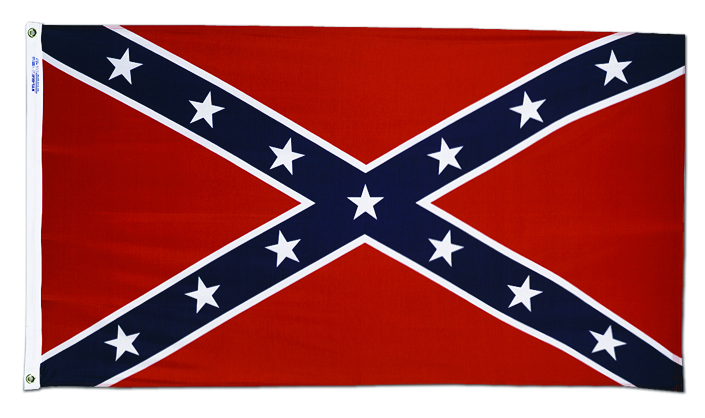 This flag was used mainly by the Confederate Navy but also by some ground troops. On September 23, 1810 Florida dragoons raised their Bonnie Blue flag over the Fort of Baton Rouge after its capture. Three days later the president of the West Florida Convention, signed a Declaration of Independence and the flag became the emblem of a new republic. 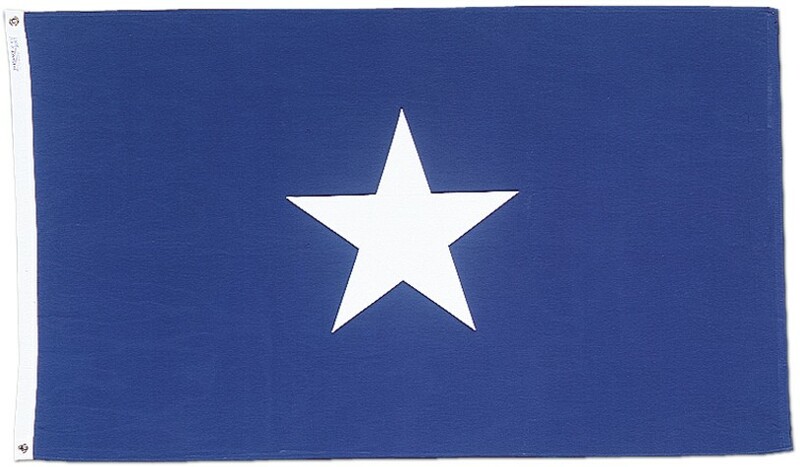 With this rebellion in mind, this flag was used by the Republic of Texas from 1836 to 1839. On January 9, 1861 the convention of the People of Mississippi adopted an Ordinance of Secession. With this announcement the Bonnie Blue flag was raised over the capitol in Jackson. The Confederate government did not adopt this flag but the people did and the lone star flags were adopted in some form in five of the southern States that adopted new flags in 1861. 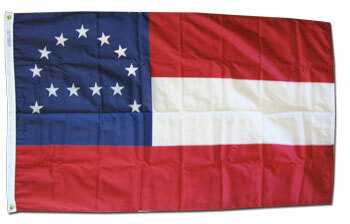 The first flag of the Confederacy. Although less well known than the Confederate Battle Flag, the Stars and Bars was used as the official flag of the confederacy from March 1861 until May 1863. Adopted on May 1, 1863 this flag displays the Battle Flag on the canton. The white field is symbolic for the purity of the cause which it represented. One of the first uses for this flag was to drape the coffin of General Thomas "Stonewall" Jackson. The original flag is now on display in the Museum of the Confederacy in Richmond, Virginia. Due to the fact that the 2nd National's pure white field could be mistaken for a flag of surrender, on March 4, 1865 this last flag of the Confederacy was adopted. This design added a red bar to the end of the "Stainless" flag. 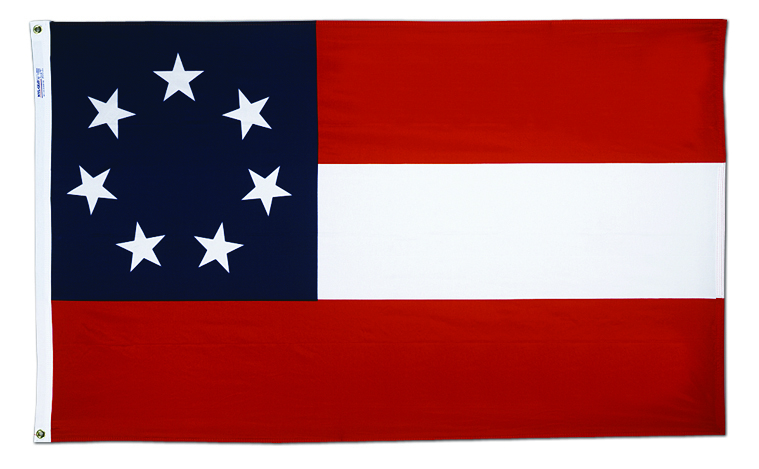 This flag flew for thirty-six days in 1865 until the South surrendered on April 9th. This version of the Confederate Flag, with its unusual 13 star arrangement, was adopted by General Lee for use at his headquarters. The General's original flag is on display at the Museum of the Confederacy in Richmond, Virginia. During the Civil War period, the Union forces used four official flags... the 33, 34, 35 and 36 star U.S. flag. The 34 star U.S. flag was one of the flags flown most extensively during this time in our nation's history. From 1861 to 1863, it was the official flag of the United States. On July 4, 1912, the U.S. flag grew to 48 stars. This flag was official for 47 years, through two World Wars and the emergence of the United States of America as the leading nation of the world. No two incidents better reflects the courage and valor of those who fought and died than the raising of the 48 star flag over Mount Suribachi. This dramatic scene occurred on Iwo Jima in 1945 and is replicated forever as a statue near Washington, DC. This flag also flew on all U.S. warships during the battle of Pearl Harbor.